"Roud" redirects here. For other uses, see Roud (disambiguation). "Roud number" redirects here. For a list of songs with Roud numbers, see List of folk songs by Roud number. The primary function of the Roud Folk Song Index is as a research aid correlating versions of traditional English-language folk song lyrics independently documented over past centuries by many different collectors across (especially) the UK and North America. It is possible by searching the database, for example by title, by first line(s), or subject matter (or a combination of any of a dozen fields) to locate each of the often numerous variants of a particular song. Comprehensive details of those songs are then available, including details of the original collected source, and a reference to where to find the text (and possibly music) of the song within a published volume in the EFDSS archive. A related index, the Roud Broadside Index, includes references to songs which appeared on broadsides and other cheap print publications, up to about 1920. In addition, there are many entries for music hall songs, pre-World War II radio performers' song folios, sheet music, etc. The index may be searched by title, first line etc. and the result includes details of the original imprint and where a copy may be located. The Roud number – "Roud num" – field may be used as a cross-reference to the Roud Folk Song Index itself in order to establish the traditional origin of the work. The database is recognised as a "significant index" by the EFDSS and was one of the first items to be published on its web site after the launch of the online version of the Vaughan Williams Memorial Library in 2006. The purpose of the index is to give each song a unique identifier. The numbers were assigned on a more or less arbitrary basis, and are not intended to carry any significance in themselves. However, because of the practicalities of compiling the index (building on previously published sources) it is true as a general rule that older and better-known songs tend to occupy low numbers, while songs which are obscure have higher numbers. Closely related songs are grouped under the same Roud number. If a trusted authority gives the name of a song but not the words it is assigned Roud number 000. The Index cross references to the Child Ballad number, if one is available for the particular song in question. It also includes, where appropriate, the Laws number, a reference to a system of classification of folk songs, using one letter of the alphabet and up to two numeric digits, developed by George Malcolm Laws in the 1950s. 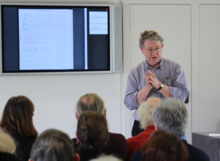 Steve Roud, creator of the Roud Folksong Index, speaking about The Full English website at Clare College, Cambridge in March 2014. The Index was compiled and is maintained by Steve Roud, formerly the Local Studies Librarian in the London Borough of Croydon. He was also Honorary Librarian of the Folklore Society. He began it in around 1970 as a personal project, listing the source singer (if known), their locality, the date of noting the song, the publisher (book or recorded source), plus other fields, and crucially assigning a number to each song, including all variants (now known as the "Roud number") to overcome the problem of songs in which even the titles were not consistent across versions. The system initially used 3x5-inch filing cards in shoeboxes. In 1993, Roud implemented his record system on a computer database, which he continues to expand and maintain and which is now hosted on the website of the Vaughan Williams Memorial Library. In the past few years the numbers have been widely accepted in academic circles. James Madison Carpenter's collection has 6,200 transcriptions and 1000 recorded cylinders made between 1927 and 1955. The index gives the title, first line and the name of the source singer. When appropriate, the Child number is given. It is still a largely unexploited resource, with none of the recordings easily available. The "Dainu skapis" ("The Dainas closet") is a similar index of Latvian folk songs and chants, created by Latvian scholar Krišjānis Barons at the beginning of the 20th century. The Essen folk song database is another collection that includes songs from non English-speaking countries, particularly Germany and China. The Folk Song Index is a collaborative project between the Oberlin College Library and the folk music journal Sing Out!. It indexes traditional folk songs of the world, with an emphasis on English-language songs, and contains over 62,000 entries and over 2,400 anthologies. Max Hunter's collection lists 1,600 songs, but each minor variant is given a distinct number. ^ Faulkner, Kate. "From shoeboxes to the World Wide Web: the enthusiast as indexer". The Indexer. 34 (3): 99–103. ^ English Folk Dance and Song Society. The EFDSS listed 187,800 records in the growing Folksong database in October 2012 (which includes all of the songs in the Broadside database with "traditional" origins). ^ "Search and browse tips". Vaughan Williams Memorial Library. Retrieved 29 March 2018. ^ "Vaughan Williams Memorial Library". English Folk Dance and Song Society. Retrieved 10 March 2015. ^ "Roud Folksong Index search page". Vaughan Williams Memorial Library. Retrieved 10 March 2015. ^ "Searchable index of James Madison Carpenter's collection". hrionline.ac.uk. University of Sheffield. ^ "Essen folk song database". essen.themefinder.org. A collaboration by Stanford University and Ohio State University. ^ "The Folk Song Index". Oberline College Library. ^ "The Traditional Ballad Index". California State University, Fresno.